The beginning of October 1967 saw C Company pulling out of the eastern portion of Binh Dinh Province and returning with the rest of the battalion to Camp Radcliffe at An Khe. The 2/5 Cav was to assume the security of the Division's base camp and the four field companies left the coastal mountains, paddies and beaches on October 2 for what would turn out to be just over a month in the Central Highlands. One of the first missions for C Company was patrolling north of Camp Radcliffe in the "Y-Ring", a zone about five to seven kilometers out from the Camp's perimeter. Although the vegetation, the villages and the terrain all were different on the plateau, the operations were familiar: company and platoon patrols, platoon and squad ambushes and combat assaults. Henry was in the 3rd Platoon. The company was securing An Khe at the time. Henry had carried my radio for a time before he was KIA. 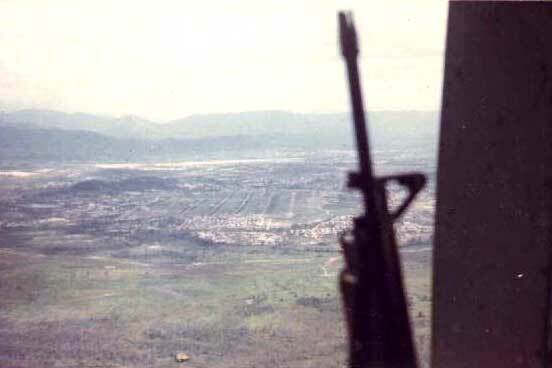 I was on an ARVN base to call in artillery in case the company was hit while on patrol. It was said he was shot at close range by kids, who escaped. Henry was shot once through the heart and died right away. SP4 Monte Zierke was wounded and evacuated after stepping on a punji stake. This happened at 2:15 PM. Its not known if this happened during the same incident in which SP4 Fugett was killed. CPT Dean Learish (center) shown here with his two RTOs - carrying the M16 is Ernest Conaway of Washington, DC, and the tall guy is Larry Wood, now of Artesia, New Mexico. 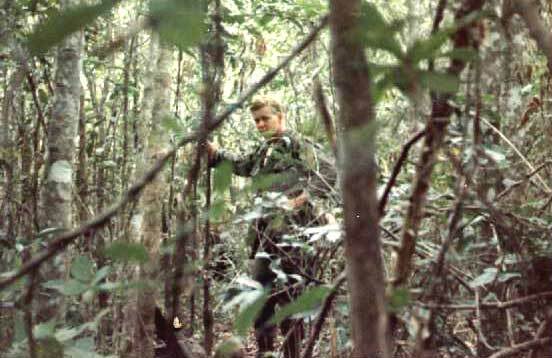 Some of the areas around An Khe were difficult to navigate, as shown by Louis Shellhammer as he tries to walk through the heavy brush while patrolling north of Camp Radcliffe. 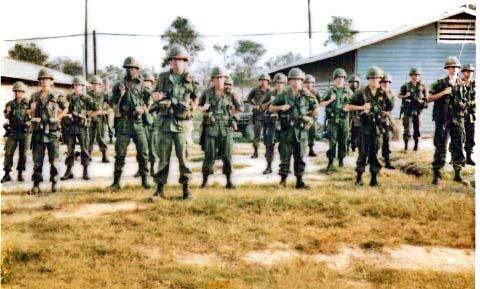 3rd Platoon at An Khe with LT James Stanford as Platoon Leader. 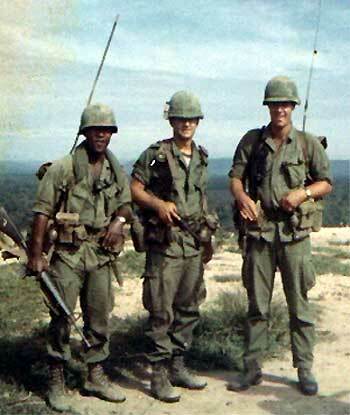 Anyone who can identify other members of the platoon please contact the Webmaster.